The current issue of OK! Magazine features the cover story ‘Rob VS Kristen’s Lover SHOWDOWN.’ This week’s magazine is all about the Kristen Stewart and Rupert Sanders debacle. There is more Twilight drama on it’s way and OK! 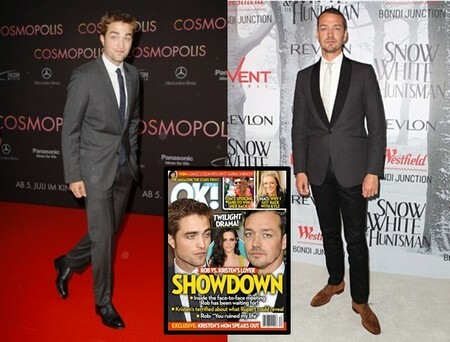 has all the details into the showdown between Robert Pattinson and Kristen’s lover Rupert Sanders. Kristen broke Robert’s heart by having a steamy affair with her director, Rupert, during the filming of Snow White and the Huntsman. OK! has the details about what is going to go on inside the face-to-face meeting Rob has been waiting for. Robert feels Rupert has ruined his life. Now wouldn’t you like to be a fly on the wall for that meeting. Rumor has it that Kristen is terrified what secrets Rupert will reveal to Robert in the meeting. She has secrets she does not want Robert to know about. She has also been hoping for a reunion with Robert and does not want Rupert to say anything to mess that up. Kristen’s family has been silent during all the drama surrounding their famous relative but Kristen’s mother, Jules Mann-Stewart has spoken out. OK! has the exclusive story of what she said. To find out more details of what is going on with Robert and Kristen, pick up the current issue of OK! Magazine on stands now!